Ohhhh something fancy from SpectraPure. The SpectraPure MaxCap DI. Big fans here. RO/DI water at half the cost eh? Whatever, just give me that sweet digital readout. 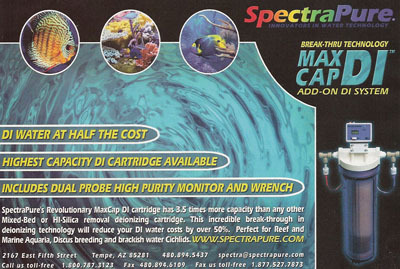 Click to see the new SpectraPure MaxCap DI! I think the addition of suction cups around the magnets would help reduce vibrations. MOre info: <a href="http://www.hydor.it/inglese/koralia.htm" rel="nofollow">Hydor</a> How much? When? Where? * Day & night time outlets turn on & off alternately. They cannot be programmed independently of each other.